AKB48 Senbatsu Election – 1st Round Results Are In! I’m delighted that Rena is inside the Top 10 and also Sasshi is in the Top 20. I did not expect to see Harugon at no.19! I’m not really surprised with the Top 5 at all, that was to be expected but it’s close between Yuko and Acchan. It would be nice if Yuko took the top spot. A lot could change though before the final election results so Sayaka fans don’t despair just yet that she’s only scraping inside the Top 21. The 2nd round results come out on the 5th June. Are you ready AKB48 fans as you’re about to find out what the first day sales figures are for Ponytail to Shushu. Has it exceeded 1st day sales of Sakura no Shiori. The answer is an emphatic YES! I can reveal that the figure is………wait for it……354,403!!!! What an incredible achievement for the group, it surpasses their last single’s 1st day figures by a whopping 124,875 copies!!! Congratulations to all of AKB48 and I’m so happy for them. The figures were no doubt helped by the senbatsu election and the 2 editions of the CD. I expect new sales records to be broken by the group at the end of the week with 400k looking very achievable for them. I can’t see them beating Arashi’s first week total for their last 2 singles (over 500k) but I’d love it if they did. It’s a great time to be an AKB48 fan! Arashi bulldoze their way into the no.1 position in the new Oricon charts and sell a very impressive 543,269 copies of their new single Monster. That’s a 1000 more copies than what they sold in the first week with Troublemaker. It’s an OK song. I’d rather have seen Kana Nishino in the top spot with Aitakute Aitakute entering at no.2. She really has released some excellent songs during the past year. There was only 4 new entries in the Top 10 this week. The other 2 new entries were 2 cool rock songs in F.T Island’s Flower Rock and TETSU69 with Roulette. There was a surprising jump up 15 places from DOES with Bakuchi Dancer which re-entered the Top 10 at no.7. AVEX’s new idol group Tokyo Girls Style released yet another new single so soon with Onnaji Kimochi. It didn’t improve their lowly chart position and it only got to no.30. Their last single Kirari was so much better than this bog-standard idol song. 22 HO-KAGO TEA TIME – Listen!! 19 Going Under Ground – Listen To The Stereo!! SDN48 are finally getting their own TV show which will give them some much needed exposure. The show will be called Suppon no Onnatachi and will be 15 mins long. It starts on Wednesday June 2nd at 1.36am on the TV Asahi channel. The content of the show is unknown right now. A comedian will present the show aided by Yukarin and Nonti as his assistants. I hope somebody will upload this show on the web. 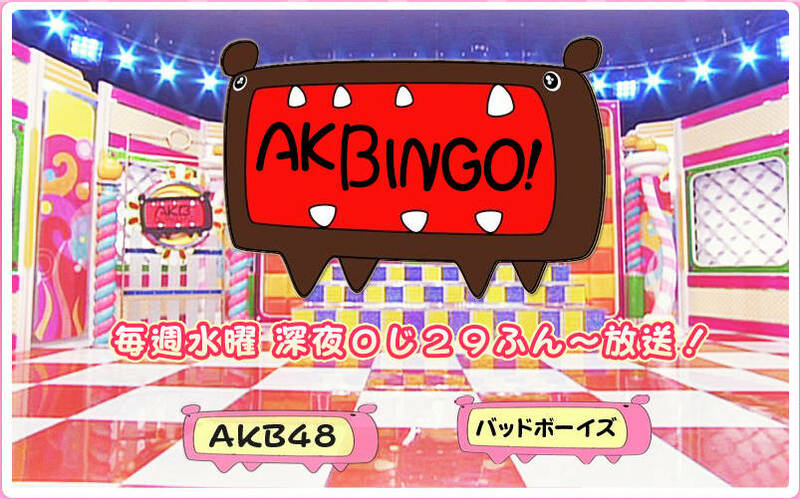 This week’s episode is the AKBingo staff pulling pranks and targeting 2 of the members to film their reactions! In the studio, Sata and Kiyoshi preside over 3 teams of 3 members who have to guess what each of the two girls will do when confronted with the situation they’re about to encounter. Prank 1 – Yukirin is the girl that’s being targeted for this prank which is great seeing as she’s the Reaction Queen. It’ll be interesting what she does in this situation. A dressing room backstage at the AKBingo studios has been set up with various hidden cameras placed strategically to capture all angles. Yuko Oshima is in on the prank when she enters with Yukirin and Kitarie. Yuko is making it rather obvious she’s aware of the cameras as she starts pulling some funny faces!! The AD comes into the room to explain something to the 3 girls. As I didn’t fully understand what was going on maybe somebody can fill me in. There’s a farting noise heard which gets no reaction from Yukirin. She’s keeping it really professional here. As she’s explaining something to everybody, the AD pretends to yawn and fall asleep – looking bored listening to Yukirin. She cottons on that he’s sleeping and says something to wake him up. He gets up to leave the room and Yukirin I thinks complains a little bit. Sata then enters the room to tell Yukirin it was a set-up. Yukirin looks shocked but I think she did rather well in the situation. Prank 2 – The target this time is Takamina. Same dressing room, different situation involving a guitar. Yuko is back again to help pull this prank. Takamina and Akicha enter the room. I think the situation was that Takamina gets to play a guitar in a fake scenario. The AD and his assistant bring in a white guitar on a stand and then leave the room. Curious Yuko then decides to take a further look at the guitar and plays about with it but she drops it on a table in which the neck of the guitar breaks!! Takamina and Akicha’s reaction are priceless. At first Takamina laughs off the damage especially when Yuko starts to fix the guitar by sellotaping the neck onto the rest of the guitar and placing it back on the stand. You can see the stress is starting to take it’s toll on Takamina and she’s beginning to crumble. The AD and his assistant come back into the room with the girls acting all innocent and sitting down. Then the AD goes to pick the guitar up and the neck breaks. The girls are asked to explain with Yuko putting the blame squarely on Takamina!! Fair play to Takamina for not saying anything back. What a star!! You can see tears start to form in her eyes, her face is beginning to contort and it’s only a matter of time before she starts to cry which she does. Sata then comes in the room and breaks the news that it’s a joke which only makes Takamina cry some more……and Akicha is crying too!! This was an awesome segment. Yuko was superb and is a great actress. Both girls that were set-up were pretty cool especially Takamina for taking a hit for the team. Respect to her! After the main segment, we get to see a small clip of the Kagome vegetable CM and then it’s a fantastic live performance of their new single Ponytail to Shushu in the studio. I love the white uniform they’ve got. And that about wraps up this episode! Next week: Dodgeball Punishment Round 4 – Acchan gets shocked!! !